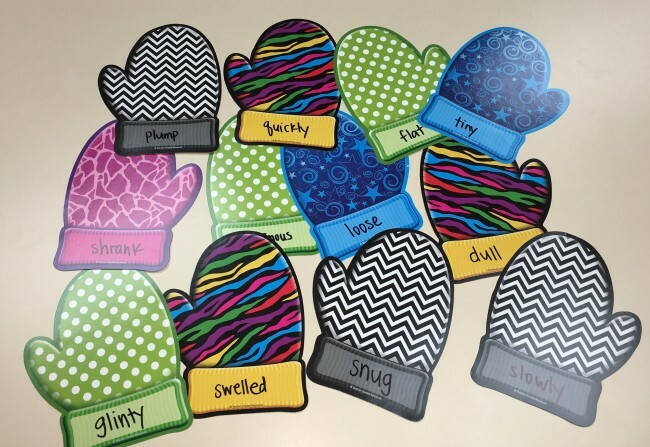 Celebrate multicultural holidays in your classroom! Chinese New Year is an important holiday. It honors household gods and ancestors. The holiday is also known as Spring Festival. This activity will introduce students to the traditions of Chinese New Year. Read a Chinese New Year passage about the history and traditions of the holiday. Then follow the instructions to make a Chinese scroll. One way people celebrate Chinese New Year is by writing and displaying messages of good luck. Sometimes they write on scrolls. They put the scrolls on the doors to their houses. 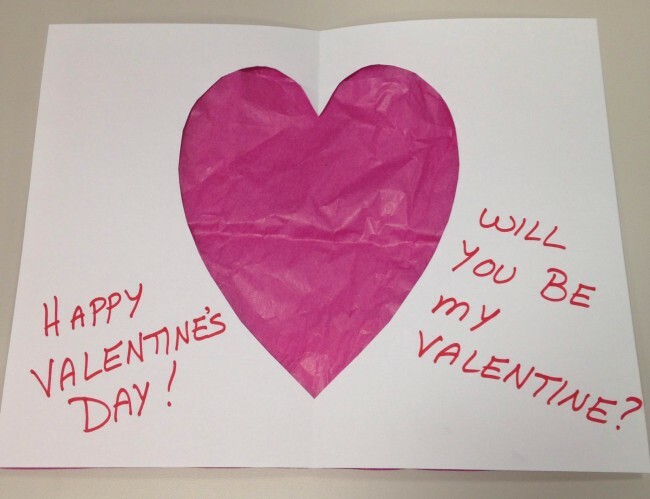 Sometimes they write good-luck messages with brushes on diamond-shaped pieces of red paper. They display them in homes or businesses. We wish people “Happy New Year!” People in China also greet one another at the new year. They want to wish people good fortune. 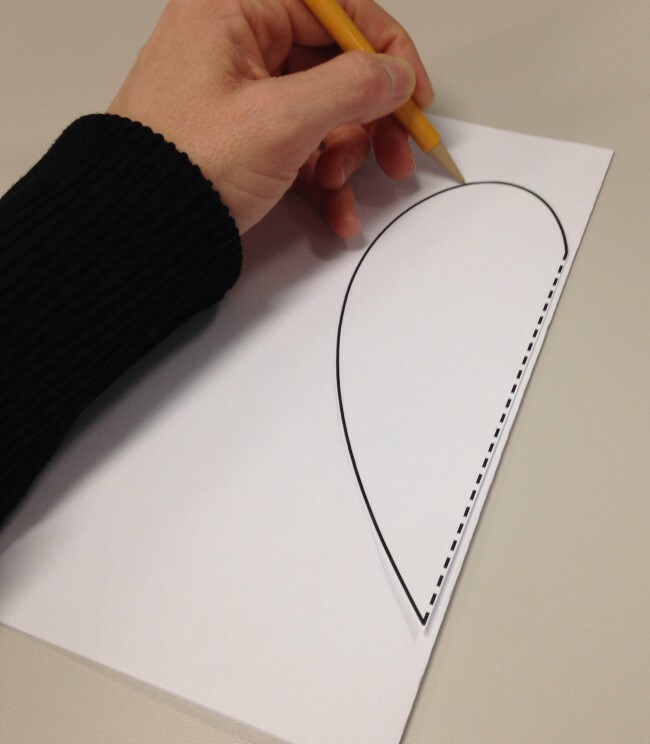 Fold a piece of white drawing paper in half lengthwise. 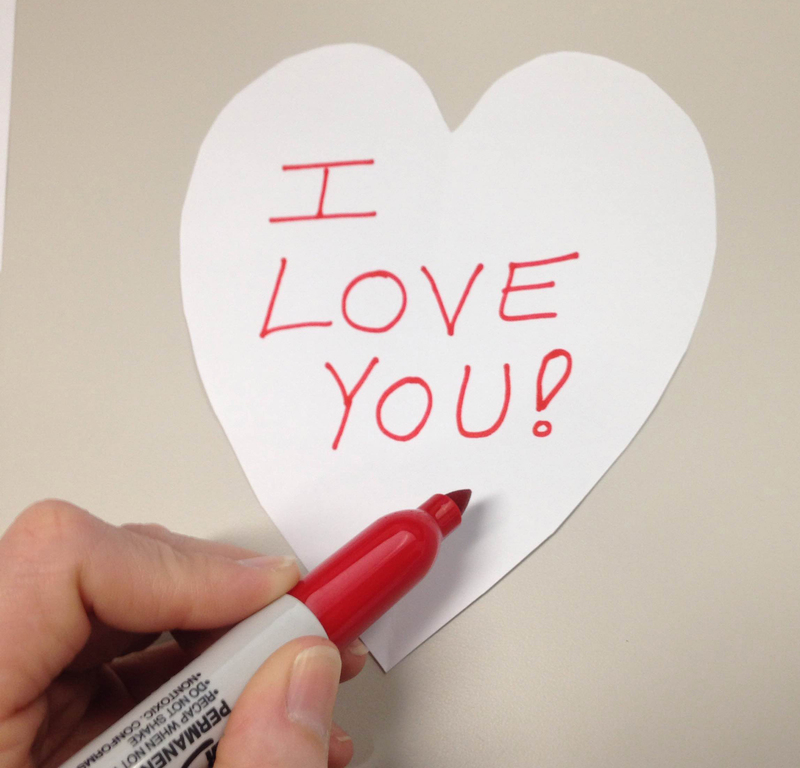 Write a good-luck message on one side of the paper. Consider using one or more of the sayings below. 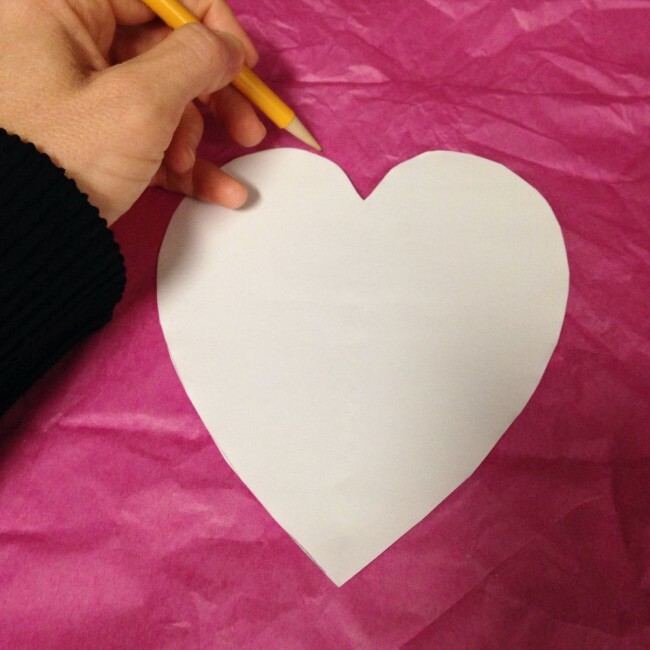 Place a pencil or stick at the top of the paper. Fold over the paper and tape it in place. Follow this same step for the bottom of the paper. 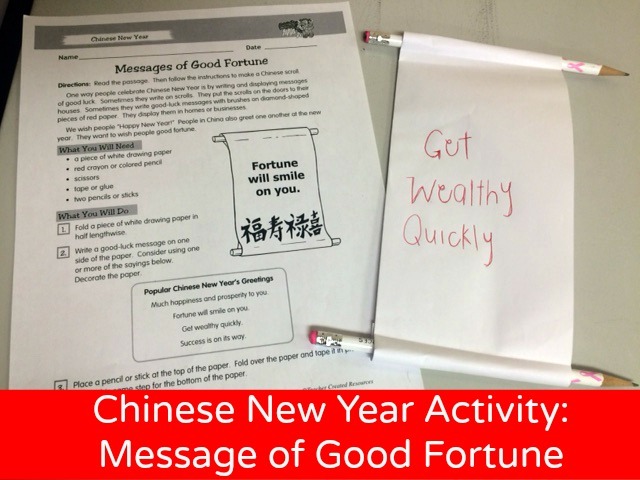 For more Chinese New Year Lessons & Activities, see Celebrating Holidays. 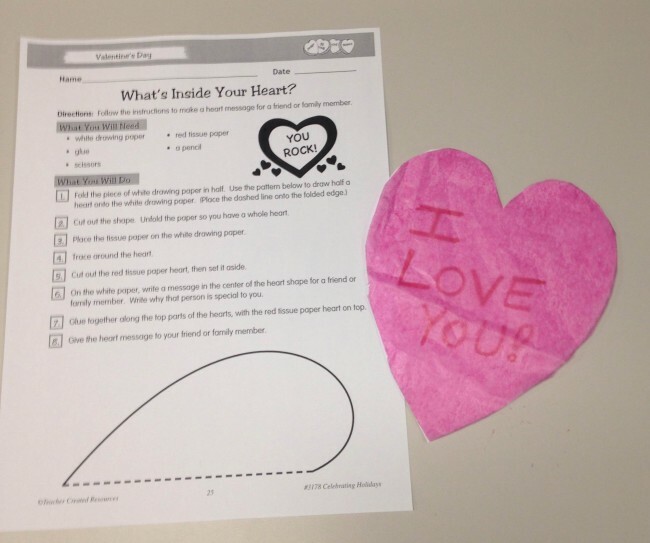 Looking for new ways to integrate fun Halloween activities while reinforcing learning? These Halloween games and activities are perfect for a classroom Halloween party, or can be used all throughout fall. This first Halloween activity is great for establishing healthy habits and getting kids to exercise. It can be done outdoors, or you could modify the physical activity to smaller movements if you wanted to do it inside the classroom. Glue a Pumpkin Mini Accent to a Plastic Craft Stick. Continue to do this for about 25 craft sticks and accents. Take a hay bale and wrap the Fall Straight Border Trim around the bottom of it. 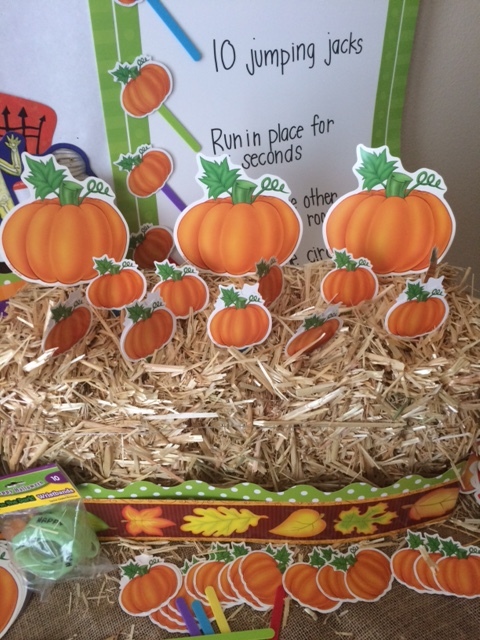 Glue the pumpkin craft sticks and insert towards the back of the hay bale. Insert the mini pumpkin craft sticks into the hay bale, making sure not to show the color of the craft stick. 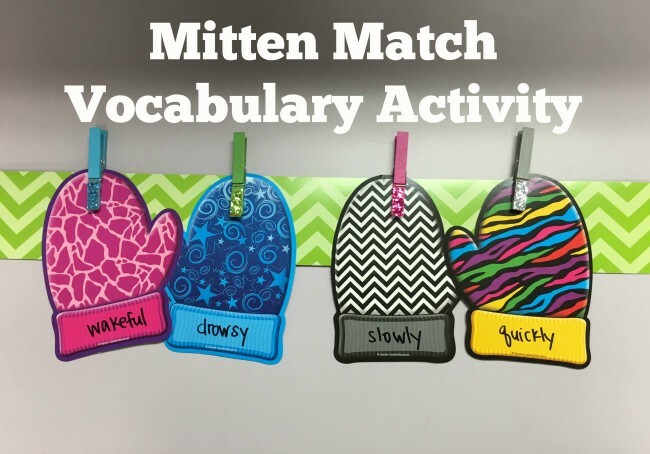 Glue each color craft stick into the Green Sassy Solids Chart and write down a physical activity for each one. Some great activities would be to do 10 jumping jacks or run in place for 10 seconds. Students will then “pick” a pumpkin from the patch. 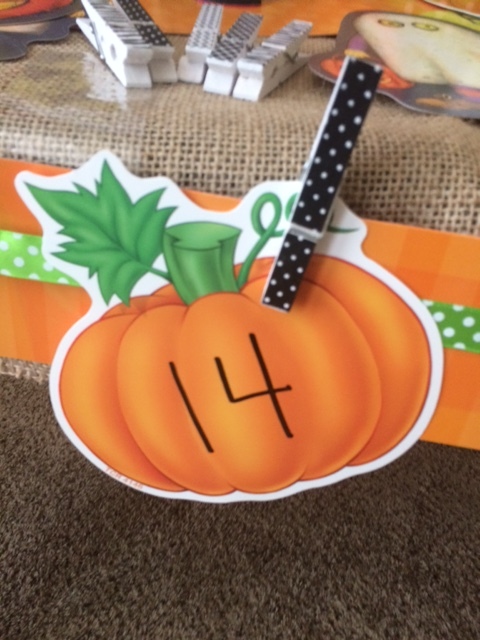 When each student picks their pumpkin, the craft stick will reveal which physical activity the whole class should do. This game can be done on a bulletin board, underneath your whiteboard, or anywhere you have space. Write a math equation on each Fall Leaf Accent. Use addition problems or any equations your class happens to be studying (without answer). Write the answers to the math equations on Pumpkin Accents. Place the fall leaf equations face down on a table. Have each student choose one fall leaf math equation. Have each student solve the problem. Using the clothespin, have the student attach it to the correct answer on the Pumpkin Accent. 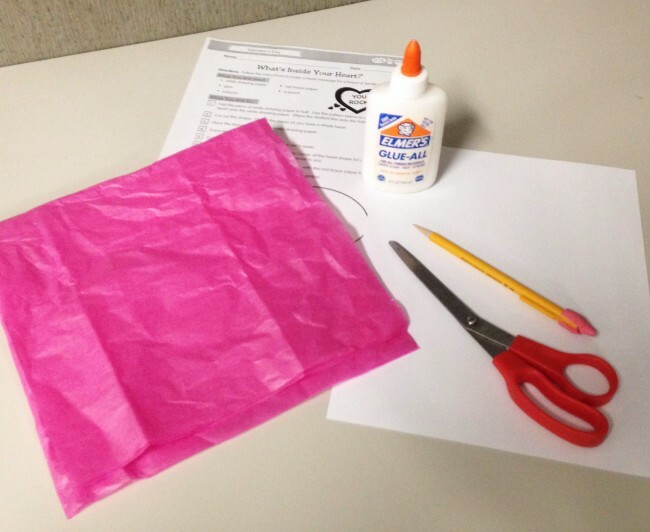 Making Halloween Party Crowns is an easy way to get festive in the classroom. 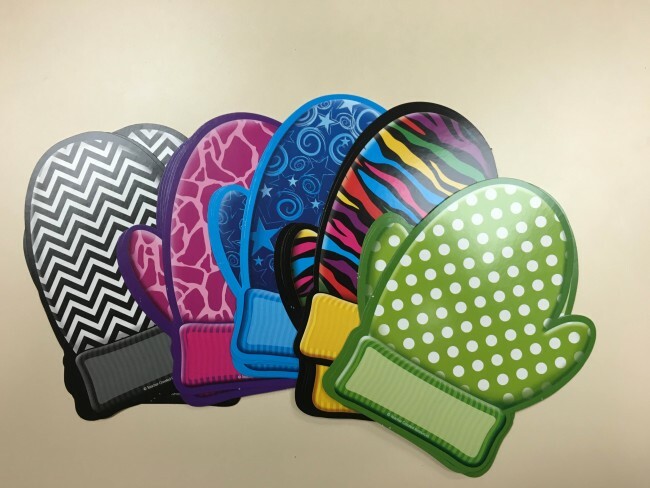 It’s especially great for schools that don’t wear costumes in the classroom. Take the Orange Sassy Solids Double-Sided Border Trim and measure it around each students head. 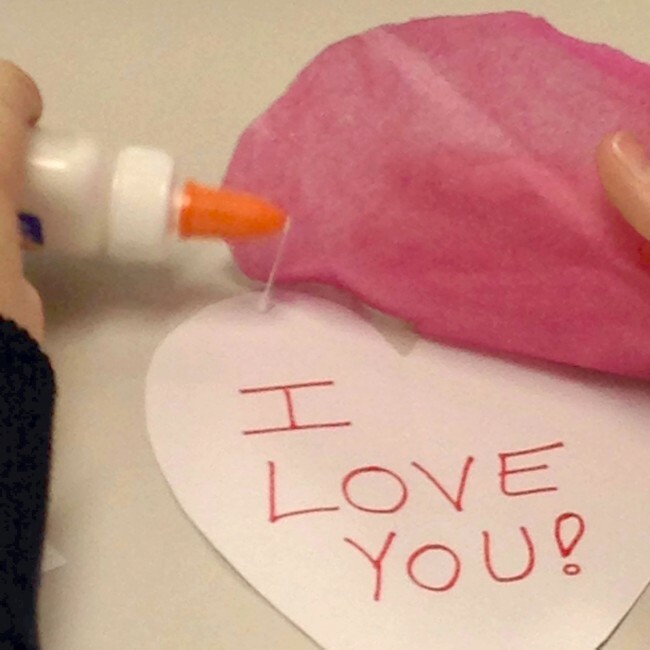 Staple or glue to secure. 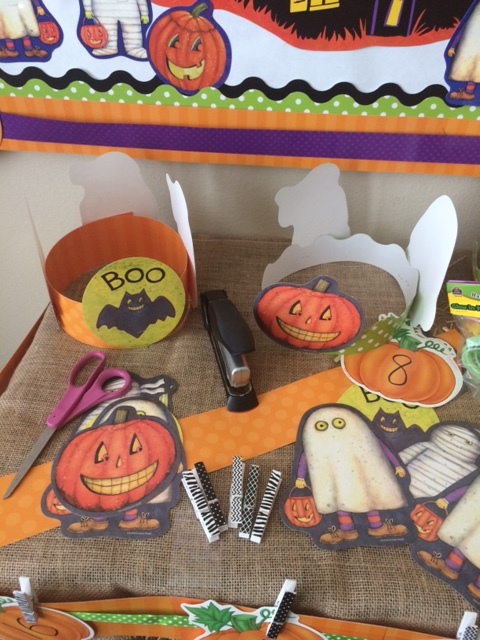 Have students choose their favorite Halloween accents and glue or staple to the crowns.